Abdulla Akelbhai has crossed 70. Yet, he decided to travel all the way from a village called Faikaron Ka Nihaan, from the border areas of Barmer district of Rajasthan to our Saturday legal clinic in Ahmedabad. The Mahiti Adhikar Guajrat Pahel (MAGP) had just returned from its campaign, with Right to Information (RTI) On Wheels, in the area from where Abdulla hails. “I had gone to Jaipur the day your van visited our area”, Abdulla said. “I got your RTI pamphlet that you had left on the tea stalls and dhabas, which were useful. 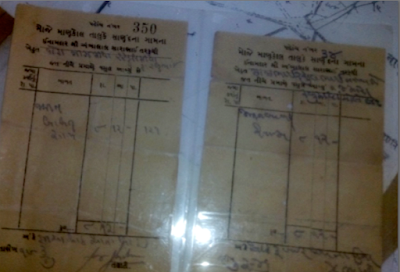 I came to know that I can track my forefathers’ land in Gujarat using RTI.Thus, I have come here”. On returning from the border areas of Rajasthan, we were somewhat familiar with a dialect of Sindh area. Miyana, Vagher and Sandhi communities of Gujarat, and people in the boarder villages of Barmer, Bikaner, and Jaisalmer, speak this language. It is also spoken in the entire Sindh area, which now lies in Pakistan. Abdulla told me, “My grandfather Abdulla Maulena used to live in a Mankol village of Sanand State. I got my name after him. Ruler Prabhatsinh Vaghela, known as Darbar, gave him 52 bighas of land for tilling (tenancy). He used to cultivate wheat, which was famous in this area.” He didn’t know the exact year, but said it was certainly about years ago. Maybe 1915..."
“It was against this backdrop that my grandfather decided to shift to the border area Rajasthan, a Sindh area”, Abdulla went on. “With time, our families spread out to several villages. A few of them went to Pakistan, while others remained in Rajasthan. Till 1995, the borders were not wire-fenced, and people did not realize the difference of being in two countries. Times have changed. Now we can’t meet our brothers.” Abdulla was in tears. “But now I am old, and my sons, too, have settled down in their life. Hence, I decided to find my own way, return to farm. When I heard of RTI, the first thing came to my mind was to locate documents of my land”, he asserted. Abdulla has studied up to 4th standard, but has very good understanding about laws and policies. He already has read our small booklet on RTI, and I was surprise to find that he knew exactly which documents he should seek from the government. 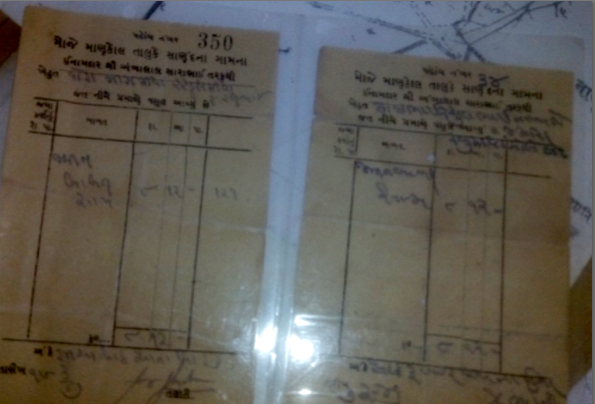 He had receipts of the rent paid to the then Inamdar – Ambalal Sarabhai – for tilling this land, which was to become the basis of his RTI query. “In the year 1946, my grandfather paid 8 rupiya and 12 ana towards ‘vighoti’ (rent for tilling). He told us that he paid in silver coins”, Abdulla quipped. Abdulla’s RTI application was drafted for seeking copies of the documents of the land from 1915 till 1947. Land records of pre-Independent time are in the archives, and can be sought under RTI. It is also possible to know the current status of the land, by getting access to documents VII and XVI from the block revenue officer. Abdulla may have planned to put up a case against the new owner, but does not have the time to fight a long battle the court. 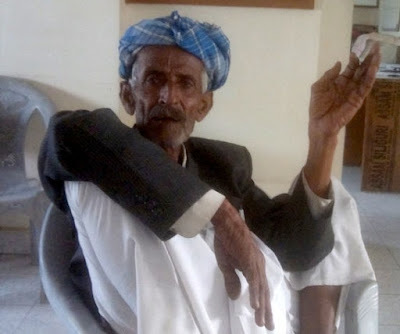 But he is sure that RTI will help him fulfill his grandfather’s dream, of locating the land, and proving their ownership… He has begun the process of locating 100-year-old document of his farm through RTI.